The strong electromagnetic pulse (EMP) that results has several components. In the first few tenths of nanoseconds, about a tenth of a percent of the weapon yield appears as powerful gamma rays with energies of one to three mega-electron volts (MeV, a unit of energy). The gamma rays penetrate the atmosphere and collide with air molecules, depositing their energy to produce huge quantities of positive ions and recoil electrons (also known as Compton electrons). The impacts create MeV-energy Compton electrons that then accelerate and spiral along the Earth's magnetic field lines. The resulting transient electric fields and currents that arise generate electromagnetic emissions in the radio frequency range of 15 to 250 megahertz (MHz, or fifteen million to 250 million cycles per second). This high-altitude EMP occurs between 30 and 50 kilometers (18 and 31 miles) above the Earth's surface. The potential as an anti-satellite weapon became apparent in August 1958 during Hardtack Teak. The EMP observed at the Apia Observatory at Samoa was four times more powerful than any created by solar storms, while in July 1962 the Starfish Prime test, damaged electronics in Honolulu and New Zealand (approximately 1,300 kilometers away), fused 300 street lights on Oahu (Hawaii), set off about 100 burglar alarms, and caused the failure of a microwave repeating station on Kauai, which cut off the sturdy telephone system from the other Hawaiian islands. The radius for an effective satellite kill for the various Compton radiation produced by such a nuclear weapon in space was determined to be roughly 80 km. Further testing to this end was carried out, and embodied in a Department of Defense program, Program 437. 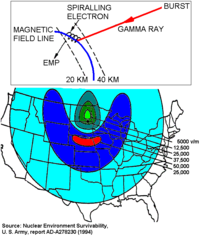 The mechanism for a 400 km high-altitude burst EMP: gamma rays hit the atmosphere between 20–40 km altitude, ejecting electrons which are then deflected sideways by the Earth's magnetic field. There are problems with nuclear weapons carried over to testing and deployment scenarios, however. Because of the very large radius associated with nuclear events, it was nearly impossible to prevent indiscriminate damage to other satellites, including one's own satellites. Starfish Prime produced an artificial radiation belt in space that soon destroyed three satellites (Ariel, TRAAC, and Transit 4B all failed after traversing the radiation belt, while Cosmos V, Injun I and Telstar 1 suffered minor degradation, due to some radiation damage to solar cells, etc.). The radiation dose rate was at least 60 rads/day at four months after Starfish for a well-shielded satellite or manned capsule in a polar circular earth orbit, which caused NASA concern with regard to its manned space exploration programs. In general, nuclear effects in space (or very high altitudes) have a qualitatively different display. While an atmospheric nuclear explosion has a characteristic mushroom-shaped cloud, high-altitude and space explosions tend to manifest a spherical 'cloud,' reminiscent of other space-based explosions until distorted by Earth's magnetic field, and the charged particles resulting from the blast can cross hemispheres to create an auroral display which has led documentary maker Peter Kuran to characterize these detonations as 'the rainbow bombs'. The visual effects of a high-altitude or space-based explosion may last longer than atmospheric tests, sometimes in excess of 30 minutes. Heat from the Bluegill Triple Prime shot, at an altitude of 50 kilometers (31 mi), was felt by personnel on the ground at Johnston Atoll, and this test caused retina burns to two personnel at ground zero who were not wearing their safety goggles. The Soviets detonated four high-altitude tests in 1961 and three in 1962. During the Cuban Missile Crisis in October 1962, both the US and the USSR detonated several high-altitude nuclear explosions as a form of saber rattling. 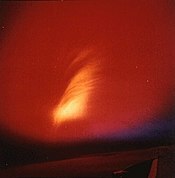 The worst effects of a Soviet high-altitude test occurred on 22 October 1962, in the Soviet Project K nuclear tests (ABM System A proof tests) when a 300 kt missile-warhead detonated near Dzhezkazgan at 290-km altitude. The EMP fused 570 km of overhead telephone line with a measured current of 2,500 A, started a fire that burned down the Karaganda power plant, and shut down 1,000-km of shallow-buried power cables between Tselinograd and Alma-Ata. The Partial Test Ban Treaty was passed the following year, ending atmospheric and exoatmospheric nuclear tests. The Outer Space Treaty of 1967 banned the stationing and use of nuclear weapons in space. The Comprehensive Nuclear-Test-Ban Treaty of 1996 prohibits all kinds of nuclear explosions; whether over- or underground, underwater or in the atmosphere. The debris fireball and aurora created by the Starfish Prime test, as seen from a KC-135 aircraft at 3 minutes. The Starfish Prime flash as seen through heavy cloud cover from Honolulu, 1,300 km away. ^ "The flash light in Siberia, Nov 14, 2014 : a nuclear test in space // Le flash en Sibérie du 14/11/2014, un test nucléaire dans l'espace". assopyrophor.org. 16 August 2015. Retrieved 16 April 2018.